For setting a limit on the purchase of Minions Happy Meal toys per customer to just 3, a McDonald's manager has been threatend by a collector. 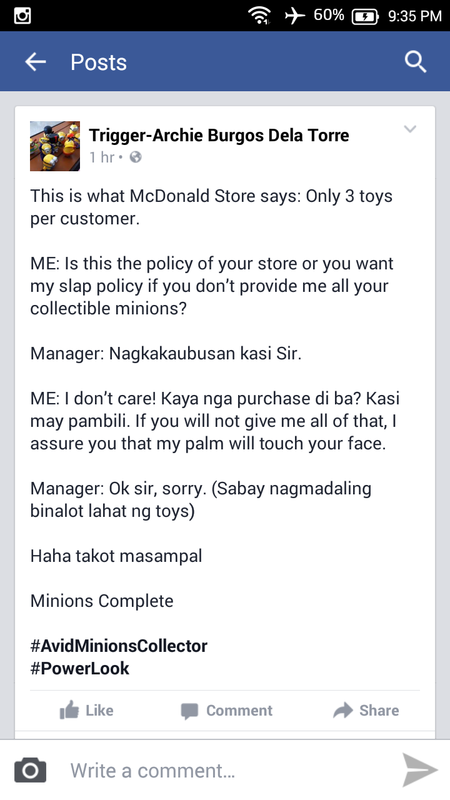 Identified online as "Trigger-Archie Dela Torre," the collector bragged on Facebook that he was able to get a complete Minions Happy Meal set after he expressed intention to slap the store manager of an unnamed branch of the burger chain should he refuse to sell it to him. The McDonald's manager hurriedly wrapped the much-loved toys after the diner allegedly said, "If you will not give me all of that, I assure you that my palm will touch your face." 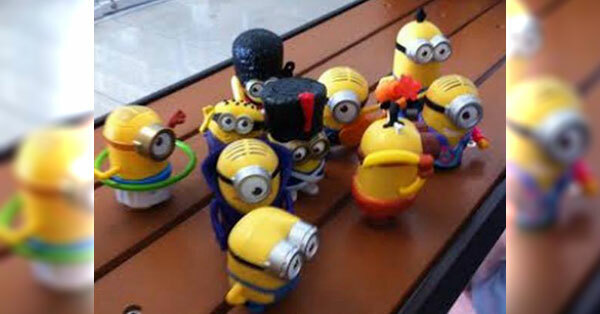 The 10-piece set of Minions Happy Meal Toys has been made available for P949 in all McDonald's Stores nationwide (except Boracay) from June 15 to 20 and select McDonald's stores from June 23 to 24. It appears that controversies involving fastfood restaurant customers are becoming a trend. Take this one with a grain of salt though. It seems the viral story is just a product of someone's playful imagination.